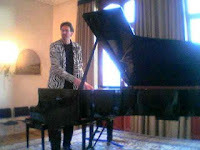 For my money, Peter Madsen, who has recorded and performed with area favorites Mario Pavone (bass/compositions) and Michael Musillami (guitar/compositions), is one of the finest pianists on the contemporary music scene. He's got technique to burn yet his inquisitive mind and ability to soak up influences and make original music is what's most impressive about the music he creates. He's now a resident of Germany but will be in the US for a series of dates in the next few months. His latest Playscape CD, "The Litchfield Suite", came out several months ago and is an unqualified success (read my review here.) Recorded with bassist Andy McKee and drummer Gerald Cleaver, the work was created at and for the Litchfield Jazz Festival and the Jazz Summer Camp where Madsen has taught for the past 7 years. This Friday (June 4), Messrs. Madsen, McKee and Cleaver come to New Haven and Firehouse 12, 45 Crown Street, for 2 sets of high-powered and lyrical piano trio music. They'll keep you engrossed and excited. The first set begins at 8:30 p.m., the second at 10 p.m. For more information, call 860-785-0468 or go to www.firehouse12.com. 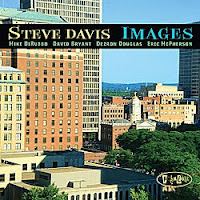 Trombonist-composer-educator Steve Davis has a brand-new CD out this week and it's dedicated to his adopted home city, Hartford. "Images" (Posi-Tone Records) contains 10 songs, all dedicated to people or places around the Insurance City. People like Mark Twain, Jackie McLean, and UCONN Basketball coach Jim Calhoun get honors as do places such as the Elizabeth Park Rose Garden, Kenney's Bar & Grill and the sorely-missed Club 880. Davis is joined by his regular working quintet that includes alto saxophonist Mike DiRubbo, pianist David Bryant, bassist Dezron Douglas, and the highly expressive drummer Eric McPherson plus guests trumpeter Josh Evans and tenor saxophonist Kris Jensen. The music on the disk really swings at times - after all, Davis studied with Jackie McLean at the Hartt School (where he now teaches) and performed in the final edition of Art Blakey's Jazz Messengers. And there is a lightness and sprightly step to many of the pieces that makes the music quite attractive. To find out more about Davis, go to www.stevedavis.info/. Here's "Nato", dedicated to Davis's close friend and bassist Nat Reeves. The track comes courtesy of Posi-Tone Records and IODA Promonet.